1. Combine milk, stock, onion and garlic in a small saucepan over a medium heat and slowly bring to the boil. Immediately remove from the heat. Allow mixture to sit for ten minutes, then sieve into a bowl and discard the solids. 2. Melt butter in a medium saucepan, over a medium-high heat. Add flour and cook, stirring for 1 minute, to create a roux. Slowly add infused milk to the roux and whisk continually until the mixture has thickened. Add McCain Diced Mushrooms, McCain Broccoli, and chicken and stir to combine. Season to taste. 3. 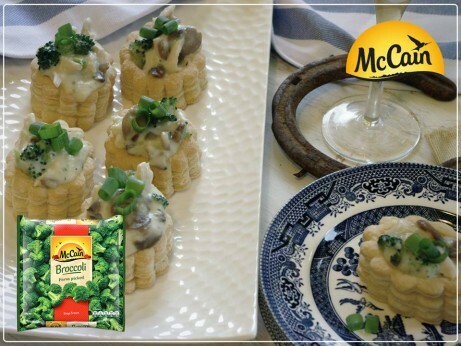 Carefully spoon the mixture into the prepared vol au vent shells and serve immediately garnished with freshly chopped spring onion. 1 Combine milk, stock, onion and garlic in a small saucepan over a medium heat and slowly bring to the boil. Immediately remove from the heat. Allow mixture to sit for ten minutes, then sieve into a bowl and discard the solids. 2 Melt butter in a medium saucepan, over a medium-high heat. Add flour and cook, stirring for 1 minute, to create a roux. Slowly add infused milk to the roux and whisk continually until the mixture has thickened. 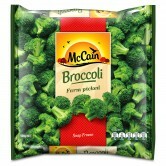 Add McCain Diced Mushrooms, McCain Broccoli, and chicken and stir to combine. Season to taste. 3 Carefully spoon the mixture into the prepared vol au vent shells and serve immediately garnished with freshly chopped spring onion.